I have never claimed to have a green thumb, but I am an eternal optimist. So recently, when my peace lily was just about on her (yes her, I named her Lily) last leg, I decided I couldn't let her give up without a fight. I researched online until I found out what might be wrong with my quickly fading Lily (pictured left). My conclusion was she had developed root rot. The only hope for her was to remove the diseased and rotting roots, which had probably developed from over-watering or poor soil, and replant her in a healthier soil and environment. Safe environment – The process of replanting Lily was likely going to get a little messy. So I needed to take her to a safe place where I had all the helpful tools close at hand to care for her – small shovel, area to discard rotted root, water source for washing roots, plenty of light, etc. Similarly, counseling can get a little messy sometimes. It's important to start the process by seeking a safe environment – credentialed professional with a confidential/private meeting space; a counselor you feel comfortable with and can trust. Care – Lily had developed root rot, so the process of healing for her involved careful removing of unhealthy roots. This process took time as I separated the healthy roots from the unhealthy ones, careful not to damage the healthy root system or the leaves. Some of the roots were intertwined, so delicate, precise movements were necessary to not weaken or break her beyond what she could handle. When you participate in counseling, there are times when some of our own roots, habits or patterns are unhealthy, and we need to evaluate - with guidance from the Holy Spirit and help from the counselor - the healthy systems from the unhealthy systems. This takes time, can be painful, and you'll need to work with the counselor in carefully moving through the process at a pace that is not overwhelming. 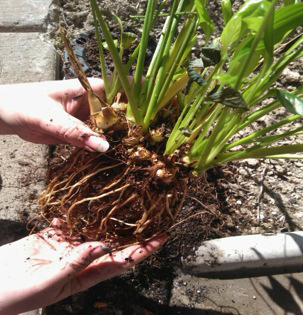 Environment for healing – After removing the unhealthy parts of Lily, the process of healing and restoration began. I washed her roots with water, prepared a soil that would offer an environment conducive for healthy growth, and began the process of replanting. The process of counseling enables healing in similar ways. Through the work of the Holy Spirit in you, and the effort you put in toward learning healthier coping skills, communication or ways to engage in relationships, healing begins to occur. Sometimes, this may even mean changing your environment in ways to that are more conducive to growth. 1 Corinthians 13:11– When I was a child, I talked like a child, I thought like a child, I reasoned like a child. When I became a man, I put the ways of childhood behind me. Follow-up – Now that Lily is in her new pot, with fresh soil full of nutrients to help her grow, she still needs help with watering and maintenance of her new environment. Similarly, you and your counselor may together conclude that the time has come for you to either decrease frequency of your sessions or possibly stop for a while. However, depending upon the issues you have been working on, it might be helpful from time to time to reconnect with the counselor for a follow-up, recharge or work on something new. Philippians 3:12– Not that I have already obtained all this, or have already arrived at my goal, but I press on to take hold of that for which Christ Jesus took hold of me. Counseling can be extremely helpful for you to address concerns and problems in your life. Most counseling sessions are much like conversations. However, there are times when a counselor will challenge you in ways to facilitate growth that might seem uncomfortable at first. Other times, the counselor will help you to develop insight or skills to improve your situation or relationship. If you've come to the place, similar to Lily, where you feel as if your environment or behavior is unhealthy, I encourage to you consider counseling. You might find counseling to be very rewarding, beneficial and a means by which God draws you closer to Him. Katie serves as the Director of Texas Baptist Counseling Services. For more information on these services, contact Katie at katie.swafford [at] texasbaptists.org or (214) 887-5488.